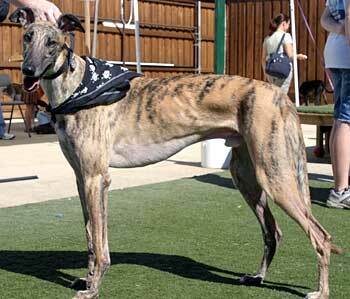 Atta, aka Sendahl A T A, is a handsome 3-year-old red brindle male born August 27, 2004. His sire is Stan's Boy Flyer, making his grand sire the late Gable Dodge, and his dam is Sendahl Cashback. Atta started his racing career July 22, 2006, at Dubuque, Iowa, and ended at Valley Race Park in Harlingen on April 3, 2007, when he suffered a broken hock. After evaluation by Dr. Jeff Ellis at VCA Preston Park Animal Hospital, Atta was referred to Dr. Bob Radasch of the Dallas Veterinary Surgery Center. Atta's central tarsal bone was broken in two places, and was diagnosed as a grade IV fracture. Dr. Radasch stabilized the hock with a 4.0 and 2.0 screw. Atta has now recovered and, as Dr. Radasch expected, Atta's use of this leg will not hinder his quality of life as a companion pet. Atta is cat and small animal tolerant, as he lives in a foster home with several cats, a medium-sized terrier mix, and two Greyhound buddies, and does well with all. Atta has made a greyt recovery from his broken hock. He had plenty of time to learn the "in's and out's" of house living while recovering. He now walks and prances with no discernable limp. At first I thought he might be lying around froggy-style because his cast wouldn't exactly allow him to "sphinx." As it turns out, it's just a distinctive part of his adorable personality. What a GREYThound! Atta loves affection and will lean in to get the most he can. 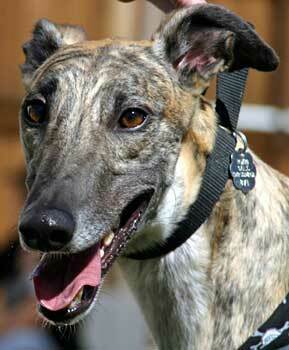 He is being fostered with two other Greyhounds, a Terrier mix, and three cats, and gets along nicely with all of them. He can be a bit of a brat with the kitties outdoors, but is harmless indoors. At night, he sleeps on a dog bed in the bedroom, and during the day, he's usually on a dog bed where he can keep a watchful eye on the human of the house. 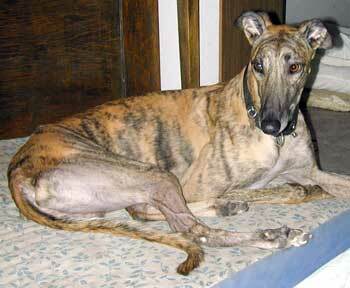 True to Greyhound fashion, Atta spends much of his time sleeping on a cushy dog bed. He loves having something to chew and is learning to play with toys. By the way, Atta likes to eat lettuce. As you can see from his photos, he's a beauty. Come meet this cutie-pie, gaze into his eyes and feel the beauty from his heart to yours as he leans in for loving.